MANILA, Philippines – Big Bang, 2NE1, Rain and IU are the No. 1 favorite singers in France, according to a survey. A total of 3,755 people participated in the online survey on tourism and Korean wave conducted by the Paris branch of the Korea Tourism Organization (KTO) from December 23, 2011 to January 20 this year. 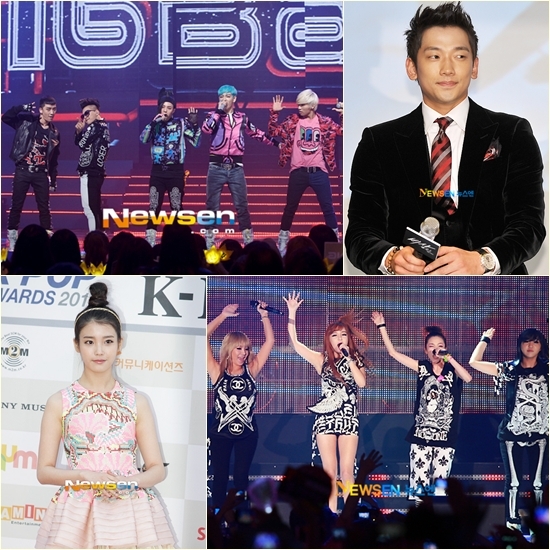 The results, released on April 3, showed Big Bang, 2NE1, Rain and IU as the top picks. Respondents were asked to pick their top three favorite K-pop stars. In the favorite male K-pop groups, Big Bang got 49.9 percent, followed by Super Junior with 45 percent, SHINee with 35.5 percent, BEAST with 33.8 percent and 2PM with 24.2 percent. In the favorite female K-pop groups, 2 out of 3 respondents chose 2NE1, which garnered 64.8 percent, followed by Girls Generation with 45.4 percent, miss A with 31.5 percent, f(x) with 29.4 percent and T-ara with 25.9 percent. In the favorite solo singers category, Rain is the top pick among male solo singers, garnering 33.2 percent while IU got 54.2 percent in the female solo singer category. A total of 95.6 percent of the respondents also said they prefer K-pop groups as opposed to 4.4 percent who said they prefer solo singers. The survey also showed that K-pop has overtaken Korean dramas in popularity. Asked what is their purpose in visiting South Korea, 96 percent said it was for general tourism, followed by 80 percent who said it was for K-pop concert. Visiting film sets were voted by 41.2 percent and studies last with 34.2 percent. The respondents were also asked on their knowledge about the Korean wave. A whopping 100 percent said they know K-pop followed by Korean dramas (91.6 percent), Korean films (69.6 percent) and traditional Korean culture (50.3 percent). The survey also asked the respondents the reasons they are attracted to K-pop. The internet has fueled the popularity of K-pop. Of the total respondents, 56.8 percent said it was through the internet that they learned K-pop for the first time while 29.2 percent said it was through friends and relatives while 9.1 percent said it was through family. When asked how their knowledge about Korea and desires from their first experience were related to K-pop, 72.1 percent they were “starting to experience Korea” while 66.3 percent said they were “starting to look more closely at Korean culture, 62.5 percent said they were considering to stay in Korea on a long term basis while 41.2 percent said they were starting to learn the Korean language.